One of the most trending food items over the last year has been Overnight Oats. Peple have been talking about this, and instagramming different recipes for almost a year now. There are 2 reasons for the growing popularity of this dish. To begin with, it is really good for health. The second and more important reason is that it is versatile, and can be made to look extremely pretty (Insta-worthy)! So if you would like to get started with this healthy fad, here is how you can put it together. The 2 basic building blocks - Milk and Oats. 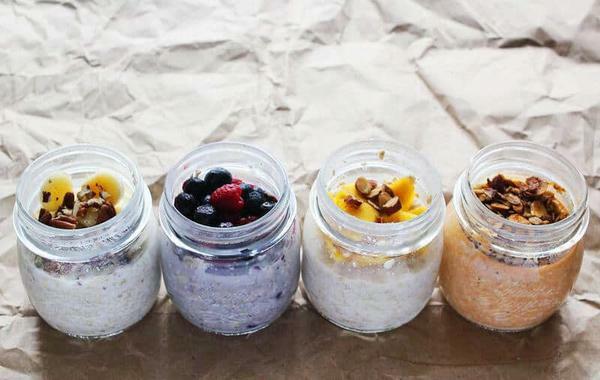 In a mason jar, start with 2 tablespoon of oats. Add in some milk. Now begin assembling your own Overnight Oats recipe by adding in other layers for taste, looks and texture. - You can add various fruit like berries, oranges, bananas, apples etc. - A spoonful of peanut butter can be used. - You may add in seeds like Chia or pumpkin seeds. - Different nuts can be used to top up the jar. Here is your own overnight oats jar, seal and referigerate for the night. Enjoy your quick breakfast in the morning!